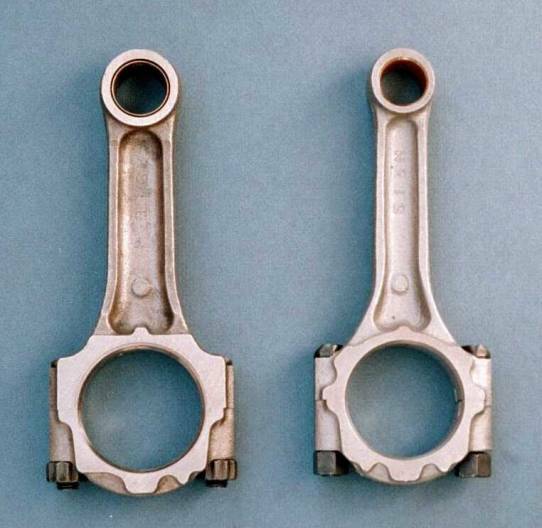 The stock 4A-G connecting rod came in two major variations. The smaller rods were available in early 4A-Gs, while the larger versions were available on later models. The variations differ in 2mm in the big end and piston pin bore diameters. The OEM piston wrist pin diameter was available as either 18mm or 20mm. The smaller diameter pin was pressed fit into the connecting rod (not requiring clips to hold the pin in the piston). Later models floated the piston pin (requiring clips to hold the pin in the piston). The large “big end” was available as either 40mm or 42mm diameter. Ideally the larger diameter is preferred, because of its greater load carrying capacity. However it is slightly heavier. Regardless, if your engine is to maintain RPMs greater than 8,000 (9,000 for later model rods) or under forced induction, the material and strength of both the piston and rods become critical in this application. 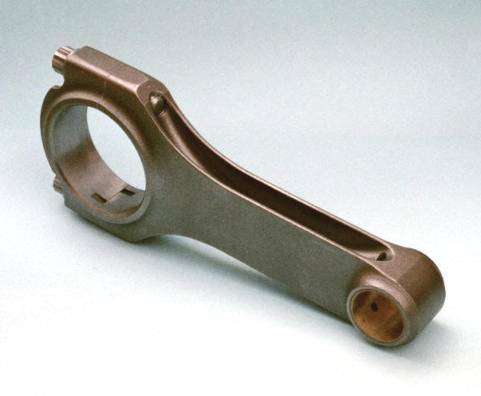 The stock 4A-G connecting rod is a standard cast ‘I’ beam design. It is perfectly adequate for stock applications, i.e., moderate street service. Although they were not designed for competition, improved reliability can be gained with a reworked OEM rod. But for the highest dependability, under very demanding conditions, a forged rod will have the strength and reliability that will be your insurance against premature failure. In such cases the use of piston pins with higher strength steels and internal tapered bores would be something to consider. However, the likelihood of a wrist pin failure is lowest on the list of things failing. In spite of that, floating the pin is a good idea. It lowers friction, and friction robs power from the rear wheels, and creates other unwanted problems. All later models had floating pins. For a street application a pressed wrist pin is adequate and trouble free, but on a competition engine fully floated wrist pins are ideal. Floating the pin increases bearing surface and gives good insurance against an over heated piston grabbing the pin, and blowing out the bottom end of the piston. It is acceptable practice to bore out the rod to float the pin. It is not acceptable to reuse the existing, used pin for this application. New pistons should come with new pins that are matched to the piston. Typical pin to rod clearance is 0.0005 to 0.0008 of an inch. The 4A-G manuals specify tighter clearance for floating pin type rods. * TRD (USA) 1988 Formula Atlantic Engine Manual. Specific Bearing and Rod manufacture was not mentioned. However the rod part number was 13202-FT001. 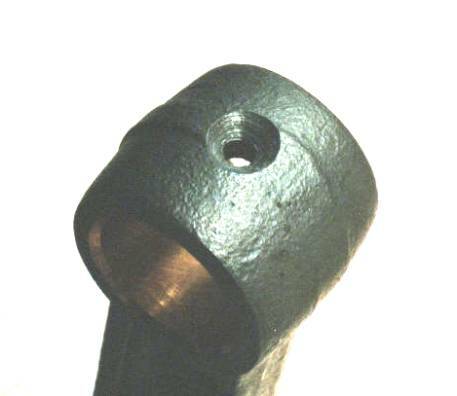 It is also a desirable practice to use a bronze bushing pressed into the connecting rod with an oil hole (access to oil is very important to avoid any metal to metal contact). The hole should be chamfered to allow oil to funnel into the hole and subsequently reach the wrist pin. Chamfering the oil hole should be done while the rod is being balanced. This will allow you to remove the minimal amount of material. Again, it is not acceptable to have no bushing. 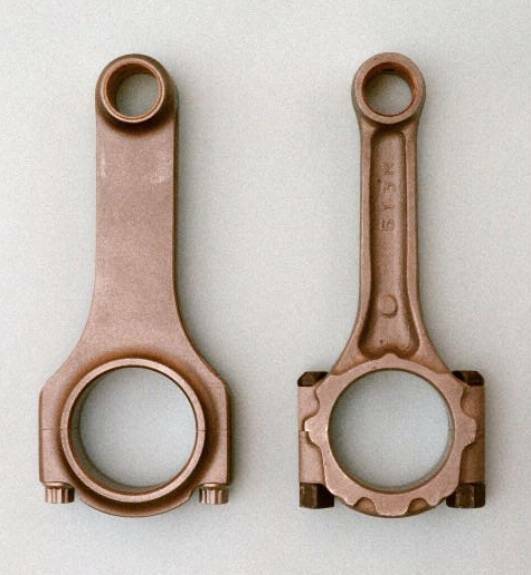 The hard connecting rod material rubbing against the hard piston pin with no oil is inviting wear, heat and the generation of metal particles that would lead to eventual engine failure. It is interesting to note that excessive side clearance increases oil demand, and leads to the noise generated from the crankshaft and possible interference at the pin boss area. Moreover, excessive side clearance results in oil leakage past the rods and in turn reduces the amount of oil available for lubrication in other parts of the engine and cooling at high engine speeds. Too little clearance restricts oil flow, and increases bearing temperatures. With the advent of larger fillets in the crankshafts for high performance and higher reliability, one should inspect to assure that the bearing shell does not ride the radius of the crankshaft. If there is interference, it will be a sure disaster. Bearing clearances are dictated primarily by the bearing, not by the housing bore of the connecting rod. The connecting rod bore determines crush. An approximate factor would be .001” per 1.000” diameter of crankshaft pin measured at the crown of the bearing surface, or around .0017inches. 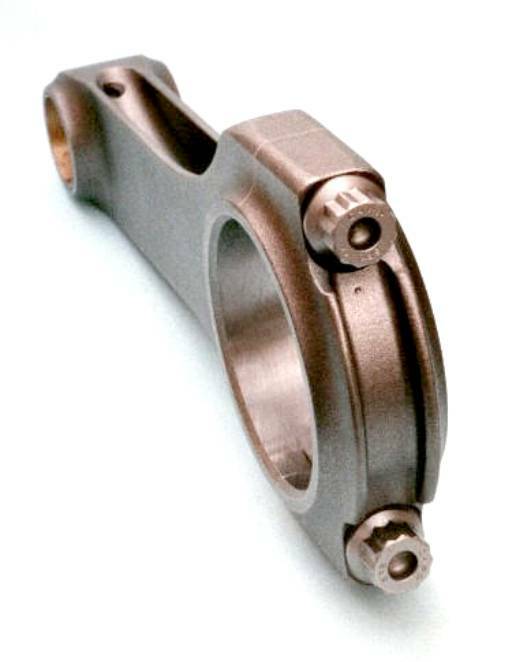 Although bearings (shell-type) are integral to any connecting rod there are a few areas to take note of. In the ideal world, the crankshaft and connecting rod should float on a micro cushion of oil and not ride on the soft, babbit portions of the bearing shell. A constant flow, at pressure, of oil is necessary to keep metal from contacting metal and to absorb heat. This heat is generated predominantly by shear and load forces on the oil. Oil needs to be free of debris and preferably cooled. Bearing geometry is a factor that affects the flow of oil. Geometry, often referred to as concentricity, is employed to effect the flow and load capabilities of a plain bearing assembly. Generally speaking, the more eccentricity in the bearing the higher the oil flow. In most cases, this increase will allow the bearing to operate cooler, but it also means the contact area is reduced and the loading is higher. The engine builder must decide which avenue is best for his application. Before reworking an OEM connecting rod, be sure the caps and rods are matched numbered and marked. (Likewise pistons are matched with their pins) Disassembly of the rod can cause mistaken cap substitution. Never use a metal stamp to identify the caps and rods. It will only create a surface flaw where fatigue cracking could occur. Each big end diameter is matched bored/honed and it is critical that the matching caps stay with its matching rod. Notice the front and back position differences of the rod and cap. 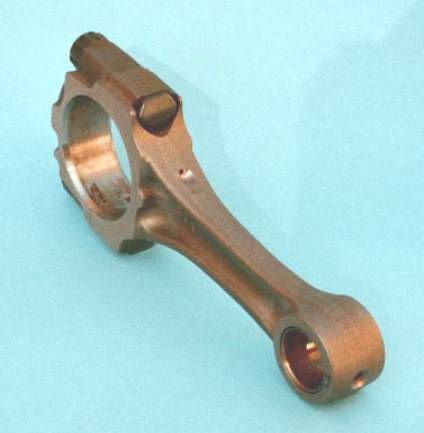 It is out lined in the factory manual for each of the various models of stock connecting rods. The accompanying figure shows the areas where polishing is critical and weight reduction can be made. All grinding/polishing must be done lengthwise using a die grinder with final finish at 400 grit. Leaving a micro scratch across the rod invites the rod to break across it. Try and remove as little material as possible. Do not reduce cross sectional area. Remove the casting flash, nicks and imperfections on the outer side of the rod. Round off all edges. Polishing the surface removes surface imperfections or sights where stress raisers could develop into cracks. A draw back to rod polishing is the possible removal of any case hardening or other surface treatments that would have to be put back into the part once all the other process have been completed. After polishing, assemble the caps to the rods. Torque to the final setting and inspect the bore diameters. If new fasteners are used they should be inserted before the caps and rods are resized. Any time new fasteners are used with a different torque value (it is recommended to stretch the fastener to the specified length rather than use a torque value) the mating cap and rod surfaces should be ground and the bores horned to nominal dimensions. It is a bad practice to reuse fasteners that the performance engine builder has no history of, even if it is OEM stock. The con rod bolt sees more types of fatiguing stress than any other fastener and care and consideration should be given to its selection and use. The use of measuring bolt stretch on the con rod bolt is the preferred method to monitor the history of this fastener. And if the fastener is replaced, note the chamfer clearance between the new connecting rod bolt and the rod to ensure proper bolt seating. The fastener’s head should lie flat on the rod. Also note that if ARP connecting rod bolts are used that one should check the clearance between the block and the top of the bolt. ARP bolts are a little taller than stock. Grinding on the block for additional clearance for the bolt tops are common when stroker cranks are used. A quick way to check for Rod squareness (OEM) is to stack each rod against each other using the piston pin to align the small end bores. 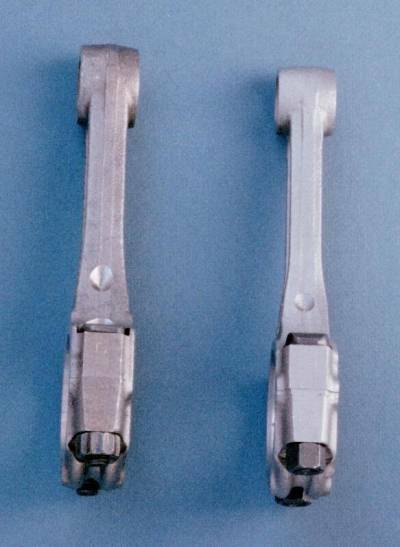 A shim should not be able to be inserted between the two rods. The rods should have no twist. Unless you have a granite layout table and a way to measure the parallel and squareness of the bores, assistance may have to be sought. The manual has tolerances. (Rod bend £.0012” and twist £ .0020”) The importance of parallelism of the big and little end bores cannot be overemphasized. The slightest mis-alignment results in heat, wear and eventually motor destruction. The rod wants to twist, the pin digs into the rod, and the piston is pushed into the pin and into the sides of the block. This is not what you want. Parallelism can be checked by the use of ground mandrels and v-blocks, together with a surface plate and a dial indicator. After the rods have been checked for squareness and twist, both the big ends and small ends need to be symmetrically balanced with the other rod’s big and small ends to within 2 grams or each other (I would recommend within 1gram or less if the engine is to constantly see 10,000 RPM). In addition, it has been suggested that the Formula Atlantic engine builders are also balancing the rods from side to side as well. Remember the rod is one of several moving/rotating components that will have to be balanced with the crankshaft counter weights before final assembly. The rod’s small end and piston assembly will move in a linear fashion, up and down (#1 and #4 will move in the opposite direction to #2 and #3). The crankshaft counter weights and rod journals will be rotating about its spin axis. 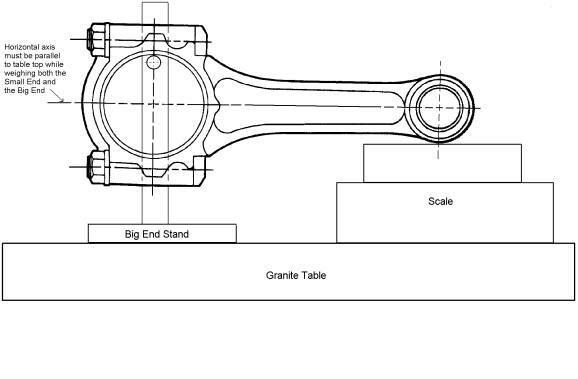 The big end of the connecting rod will be orbiting the centerline of the crank while appearing to rotate about the rod journal in the opposite direction. 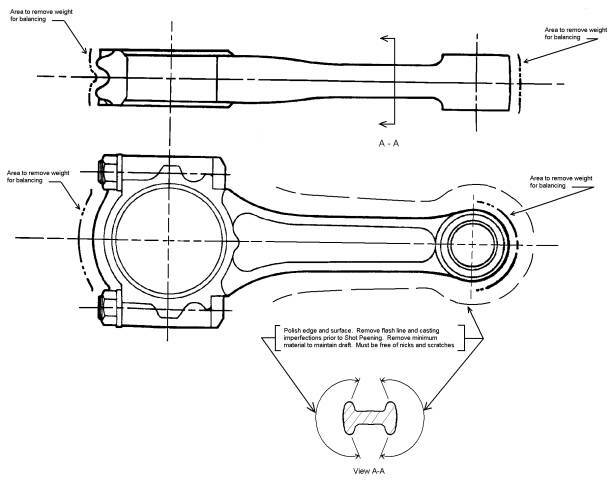 The other parts of the connecting rod will be doing both, orbiting the crank centerline and moving up and down. This creates a complex dynamic motion. Please note, to dynamically balance an engine, it is best left to an expert with the equipment and knowledge to do a proper job. An inline four cylinder engine is inherently unbalanced. There will always be the secondary vibration and unless one uses a mechanical cross slide (Scotch Yoke), the best one can do is a compromise between the different dynamic motions of the parts and ultimately the engine assembly. As an interesting observation, it appears that during a recent 20 valve, silver top, tear down, Toyota (stock OEM) balanced their rods to within 1 gram of each other. After polishing and balancing, the modified rod can be re-heat treated, but before you spend additional time and money, the rods should be magnafluxed. Microscopic surface cracks may not be detectable under normal conditions and could lead to a future catastrophic event. Note, magnafluxing does not pick up porosity, but x-raying usually does (although it is operator dependent). Magnafluxing and x-raying are good tools that should be used before upgrading production rods for high performance work. It will not increase performance but it will sure help keep catastrophes from occurring. After inspection, the rods should always be shot peened per AMS-S-13165 (Mil-S-13165C has been canceled). Beware of shops claiming to shot peen. It is not a simple “bead blasting / glass peening” process, at least not to the quality you ought to be putting into a performance motor. It is recommended that if you are not familiar with the shop doing the work, you should be familiar with the proper way it should be done, reference SAE standard, Aerospace Material Specification, AMS-S-13165. This will give you a basis to ask questions and judge workmanship standards. Shot peening is a surface hardening process, that induces residual compressive stresses in specified surfaces, for the purpose of improving resistance to fatigue, stress corrosion cracking and galling. It uses steel shot or ceramic beads that pound the surface the way a black smith would use a hammer to forge with. It is not supposed to remove material. An uncontrolled process could do damage/deform or put unequal surface stresses in the part that could lead to premature engine destruction. As an additional note, no manufacturing operations which relieve stresses developed by the peening should be permitted after shot peening, e.g., heating to relieve hydrogen embrittlement or other thermal treatment. The new micro dimpled surfaces finish will be harder and as proof of a proper shot peen job, a hardness measurement should be made. A small dimple should be visible some where on the rod. 13201-FT002454 grams (avg. wgt. of 8)**, “H” Beam design, Carrilloy (4340) forged, cyro aged, heat treated, polished steel. Each rod is balanced and then shot peened and 100% magnaflux and hardness checked. 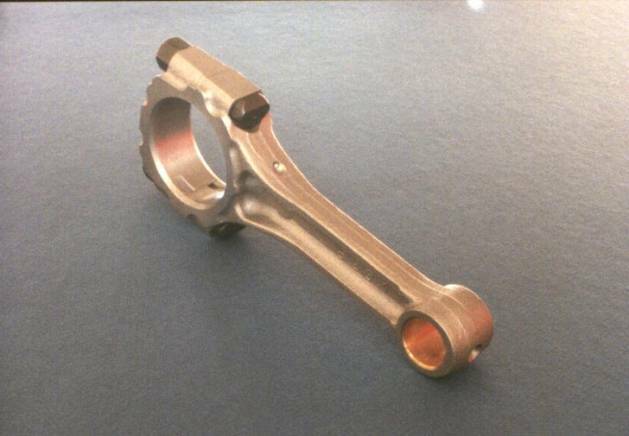 Photo of a Hi-Comp late model connecting Rod. Notice the width and extra material around the small end and large ends of the Rod. 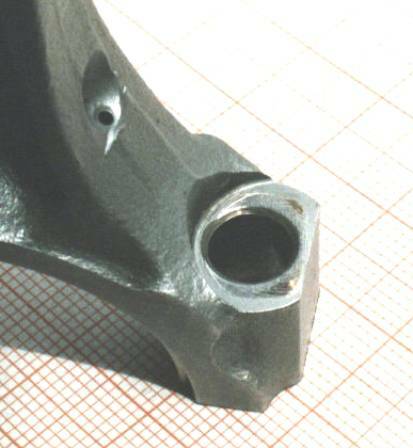 Photo of an early model small journal diameter 4A-G connecting Rod. Notice the Rod has been modified for floating piston pins and ARP connecting rod bolts. Photo of an early model 20 valve (silver top) connecting rod. Notice the thinner neck. 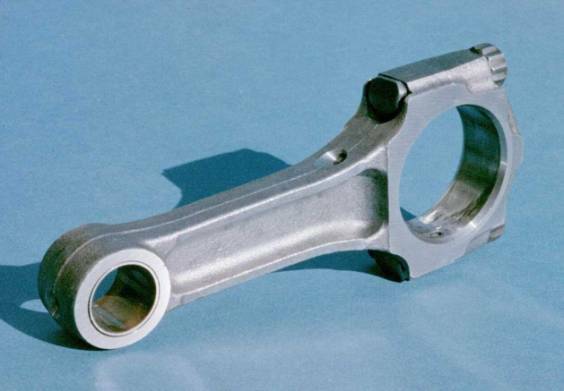 Photo of a reconditioned Formula Atlantic Carrillo connecting rod. Notice the ‘H’ design configuration. Notice there is no lubrication hole on top for the floating piston pin. Side by side comparison of a late model HiComp on the left and a Modified Early model small journal Rod on right. Notice the thickness difference around the Small and Big ends. Also notice the thick neck section on the HiComp. 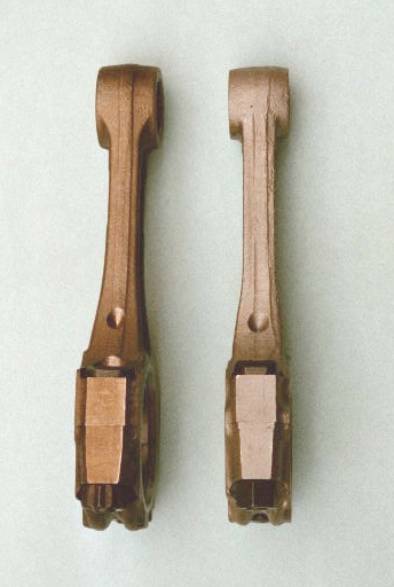 Side by side comparison of an early model 20 valve on the left and a Modified Early model small journal Rod on right. Notice the thickness difference between the Small and Big ends. Aside from the larger inside diameter (20mm) of the 20-valve rod small end, both rods have relatively narrow necks. Side by side comparison of a Carrillo rod on the left and a Modified Early model small journal Rod on right. Notice the total differences, but the weight is nearly identical. This Carrillo rod’s inside diameter small end is 19mm. This Carrillo rod has no provision to squirt oil to the side of the cylinder wall or to the top of the piston. There is no lubrication hole on top. Lubrication to the piston pin is provided for by holes just under the small end. The rod is symmetric. There is no right, left or front or back. Also notice the extra clearance between the block and rod shoulders by using a screw type fastener rather than a bolt. This is a reconditioned Formula Atlantic Carrillo rod. 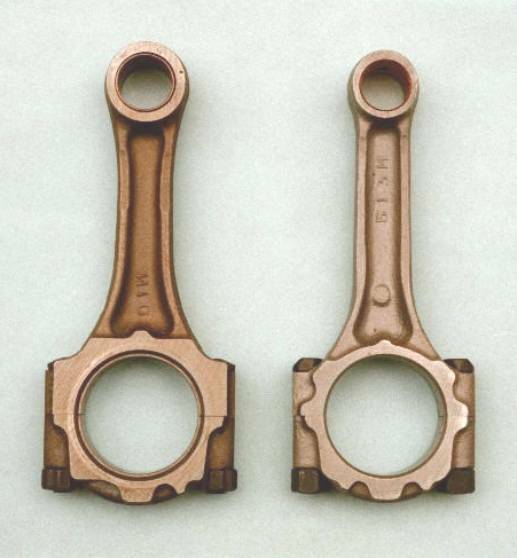 Nevertheless it is the ‘mother’ of all connecting rods. Notice the special 12 point 3/8 inch Carrillo specified SPS fasteners rated for 260KSI ultimate tensile and the small dimple where the rod was hardness check after the shot peening process. As a note, new rods will have a matching alphanumeric stamping on the side to identify them during manufacturing. Reconditioned (used) will many times have this ground off. This Carrillo design is symmetrical. However, the cap of the connecting rod must be placed relative to its original manufactured position. The bearing tangs inside the cap would be on the same side of the connecting rod when assembled. 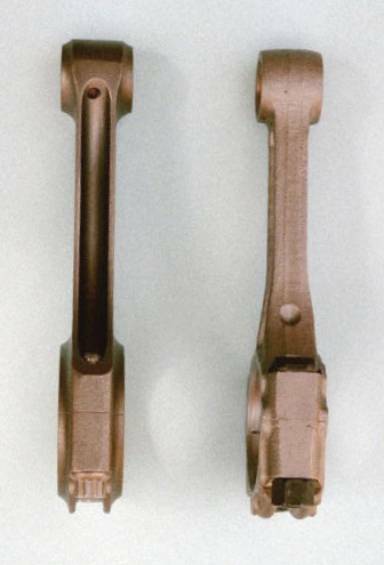 It is suggested that before the parts are disassembled an electric pencil or similar device be used to identify and number each connecting rod and cap. This is non-evasive and assures that the correct caps and rods are assembled properly. Each set of new rods includes Federal Mogul’s Felpro Moly base assembly lube to insure the proper ‘stretch’ during assembly. Close up of modification to allow oil to the piston pin. Notice pressed fit Bronze bushing. Close up of intake side of early model connecting rod showing oiling hole for intake side of cylinder bores. Notice chamfer around fastener hole for proper seating of the replacement rod bolt head. This area is the thinnest and thus weakest point on the early, small journal diameter rods. Sketch of Rod balancing procedure. Figure shows Small End being measured first. The resulting measurements would be compared to the other Rod’s Small End measurements. They should all be within 2 Grams, ideally 1 Gram. Conversely the Big End would be measured in the same manner. Listing of part numbers illustrate factory differences. Part numbers and years may vary depending on original country of sale. Part numbers are subject to change without notice and may not be available. * Part numbers and material call out listed for Carrillo Rods were from an old TRD Catalog or from a similar source. Carrilloy material is similar to 4340 with a little more vanadium. Carrillo special orders the material from Timken. All of Carrillo rods are’ H’ beam design to insure “efficient use of available material (lightness) “ and “specifically the strongest for the weight”. The fasteners are SPS with a special taper thread design to ensure that 80% of the engaging threads are equally loaded once they are stretched in place. Carrillo rods are arguably the standard by which all other rods are measured for the 4A-G.
**Weight and measurements of Rods are based on a small sample size without bearings. Manufacturer’s tolerances do create product variation and noted values are only intended for comparison purposes. The stock 4A-G rod is 122mm nominal length. After-market rods can be as long as 128mm. However the piston design must compensate for the extra length, i.e., in piston compression height (pin center to top of piston) or the pin offset relative to the cylinder bore center line. Theoretically the extra length is to assist in efficiently/effectively equalizing compression and combustion pressures and/or reduce side loading on the piston skirts, thus allowing for the reduction of piston skirt length, i.e., weight. The last version of the 20-valve rod did not have an oil hole to assist in lubricating the intake side of the cylinder wall. The oil holes in all the other 4A-G rods align with the cross drilled oil hole in the crankshaft’s connecting rod journal at approximately 55° after TDC and 95°before TDC. Joel & Joji Luz, Toysport, Gardena CA. Corolla, Levin, Sprinter, Trueno, Special Edition Bible, TRD, 1996. Jack Sparks, Carrillo Ind. web site, correspondence dated 11/2/99, Southern California SAE tour 12/2/00 and e-mail dated 3/9/01; Carrillo Industries, San Clemente, CA. SAE, Society of Automotive Engineering, Inc., Warrendale, PA.